Monitor lizard… make way, I’m coming through! 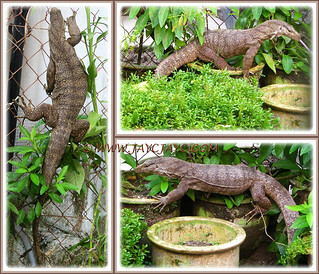 What a wonderful sighting outside our backyard – a monitor lizard came a-visiting! Not a tiny-weeny one like the Garden fence lizard but a large and fat fella. Having our afternoon siesta in the quiet of the afternoon a few days ago, we were suddenly jolted by the thunderous and continuous barking by our darling pet dog, Maxi. I jumped up, fully awake when my beloved John, the first to check the cause of the din, woke me up to inform that a monitor lizard was just outside our backyard gate. I grabbed my camera hastily and headed in that direction. It had been more than a decade since we last saw one and I definitely was not going to miss this golden opportunity to view it up-close and photograph it. Wow! I was amazed to see that the monitor lizard was huge, easily not less than 5 feet long from nose to tip of tail! And guess what… it just gazed at us coolly, regardless that our dog was barking unceasingly at it. Somehow I didn’t freak out or was afraid at all, I supposed my desire to get snaps of it was much greater! Without hesitation, I unlocked the gate to commence my shooting spree. In fact, it was more afraid of me. Each time I went forward for a shot, it’d move away and hide between the large pots, drains and whatever that could keep it hidden from view. Probably, it was intimidated by my hand-held camera with the protruding zoom lens that seemed like a ‘gun’ and thought the worst. Hehe… I was relentless in getting as many good captures as possible. Poor dear, in a way I gave it an exhaustive workout as it moved from right to left and back again aimlessly and confused, inside the backyard of 2-3 houses opposite ours, along the back lane. Nature has many amazing surprises for us humans to marvel at. It was truly an awesome encounter with the fascinating creature, rarely seen in our neighbourhood. Wondering how come this beauty came wandering along our back lane, sloping upwards to our house, the sixth in the row. The back lane is inaccessible to traffic as it is split level with a few steps after each link-house. I feel blessed to have had such a wonderful fun-time experience with this fellow. An added bonus is to be able to enjoy on my iPhoto library the many captures taken, showing its lovely form, structure and intricate markings on its skin. Praise and thank The Lord for such joy and sheer delight! Hope you’ve enjoyed the pictures as much as I did sharing them! well that woke you up from your siesta in a hurry I bet! We get them here too, and they are quite noisy. You got some lovely photos – thanks for sharing them. Thanks, Gillian. I’m so delighted to get these priceless shots… was well worth sacrificing my nap to photograph this rarely seen creature in our concrete environment. Oh! 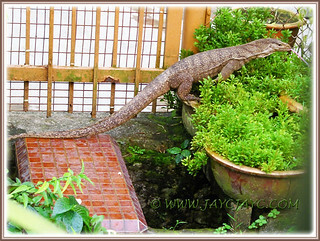 that beautiful monitor lizard, is fat and healthy … beautiful visit Jackeline ..
Amazing, it has been years for me too, since I last saw one of these! Thank you for visits and kind comments, Chellet. Indeed, a wonderful encounter that’s most cherished. Praise and thank The Lord for such joyful life adventures. Thank you so very much for ID… you’ve made my day! Truly appreciate your help. God bless. Have a nice Friday and wonderful weekend.